Shire, November 09, 2017: Their Royal Highnesses Crown Prince Haakon and Crown Princess Mette-Marit today visited Eritrean refugees at Hitsats refugee camp in Tigray region where more than 11,000 refugees are sheltered. The Crown Prince appreciated the government of Ethiopia’s open-door policy allowing refugees to come into its territory. In his remarks, ARRA Deputy Head, Zeynu Jemal, highlighted the generous support of the Norwegian government and the personal commitment of its Ambassador to Ethiopia, Mr. Andreas Gaarder in bringing more help to assist refugees living in Ethiopia. He mentioned Ethiopia’s generous hospitality as being one of the most ancient with the first arrival of persecuted Muslims of Arabia early in the seventh century when they immigrated to Ethiopia to receive protection and safety in the then Abyssinia. Zeynu underlined the visit as a boost to enable humanitarian agencies involved to work hard and commit themselves to the benefit of refugees. Chairperson of the refugee committee, in his remarks, pinpointed the recurrent challenges refugees are facing and called for increased support of the Norwegian government. While meeting refugees at a Norwegian Refugee Council vocational training center, the Royal Highnesses were amused with the skills refugees are acquiring through enrolling in various skill training programs including in food preparation, wood and metal work among others. They were curious to know how refugees are coming and how they are being assisted in camps. On their way back to Aksum, they had a chance to see the registration of newly arriving refugees at Endabaguna registration center which accommodates hundreds of fresh arrivals waiting to be screened. Their Royal Highnesses also visited community care arrangement for unaccompanied children. 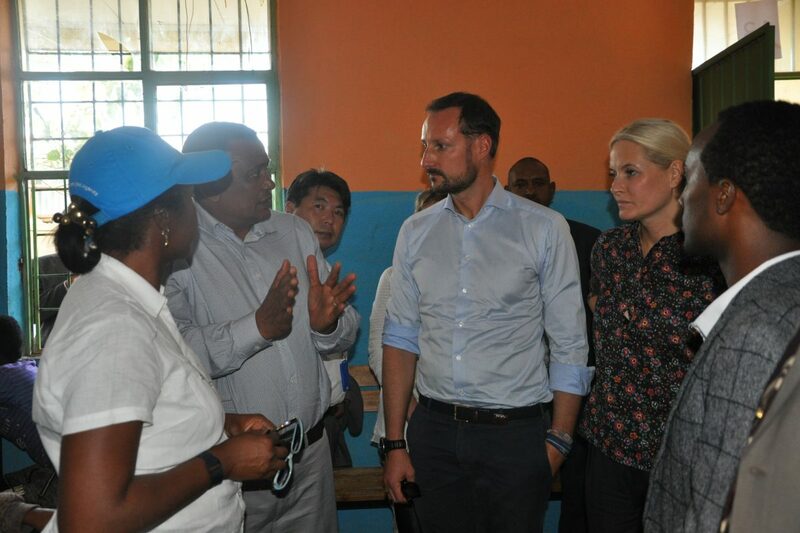 While meeting the press, HRH Crown Prince HAAKON & HRH Crown Princess METTE-MARIT expressed their gratefulness and thanked Ethiopia’s hospitality for hosting large number of refugees including the over 11,000 refugees at Hitsats Eritrean refugee camp. Norway is an important donor country assisting the Ethiopian refugee program for many years with increased financial assistance in recent years.